In November 2012, I designed the first version of Microduino, a compact size Arduino Uno compitable board. it's small and stackable. The idea of Microduino is building Arduino Uno circuit in two seperate boards: an arduino minimum system (named as Microduino-Core) and a ttl2usb board (named as Microduino-FT232R). the pinout of two boards is well defined as a U-shape 27 pinout, 27 signals is carefully arranged and utilized, so that the two board can be stacked together, functioning as an Arduino-Uno board. the size of Microduino is as 1.0inch x 1.1inch, just like a quarter. it's very small. the pin heads and socket can be stablely connected, it means Microduino can be used in a low volume design production! it's intersting expeirence, I'd like to share it with you. All Microduno boards are completely open source, check here and find more information! http://wiki.makemodule.com . if you want to know more information about Microduino, please check my facebook https://www.facebook.com/Microduno. The purpose of designing Microduino was to build a small device to monitor server room temperature remotely. I actually had already built a prototype with Arduino. However, as you know, the size of Arduino was really big. I searched for smaller Arduino compatible board with no luck, and decided to design my own. To decrease the board size without sacrificing performance, usability, and extendibility, I split the Arduino-Uno circuit into two parts: the -Core circuit, functioning as an Arduino minimum system, and the -FT232R circuit, communicating between PC and -Core. A U-shape 27 pinout was also well defined and utilized for better functional extension. Microduino-Core and Microduino-FT232R stacking together matchs the power of Arduino-Uno. the size is small . Afterwards, I designed several other extension boards: -Enc for Ethernet communication; -nRF24 for wireless communication in 2.4G frequency; and a -SD card for recording temperature history. I stacked the boards together and connected temperature sensor in a standard hole board – BTW, Microduino is compatible with a standard hole board, but Arduino is not. Then, Arduino program was developed to make the device work. With this small device, temperature data can be automatically pushed to internet; so I can even real-time monitor the server room temperature at home. I built 8 sets of this device, and they have been working well till today. Microduino is Arduino compatible and completely open-source. Microduino is small. The board is only 1.0 inch X 1.1 inch, the size of a quarter. 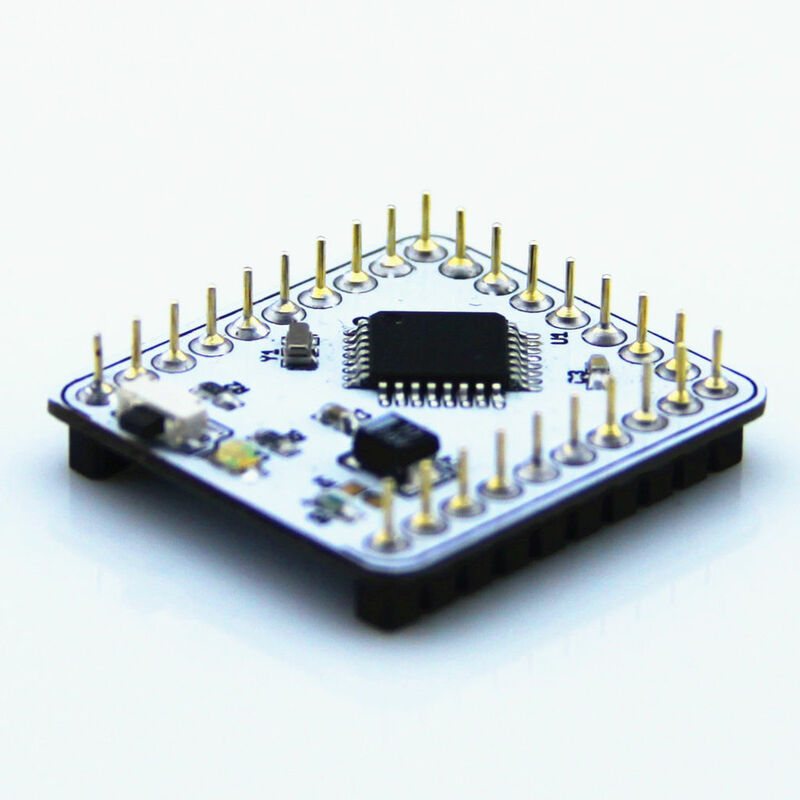 It's stackable, every Microduino board can be easily stacked together through U-shaped pins. Over several months testing, we have made several revising, the boards are finalized. Microduino-Core + Microduino-FT232R both match the power of an Arduino-Uno board. it's completely compatible with Arduino development environment. consequently, I designed a series of Microduino extension modules. Every Microduno module adapt uniformed UPin-27 pinout, and it's well configured across different modules, without any signal conflict. it's very easy for designers to append various features in your design prototype and idea realization. The Microduino-Enc features an Ethernet port. The Microduino-nRF24 enables wireless communication in 2.4GHz frequency. The Microduino-SD features an SD card slot. The Microduino-BM manages Li-ion battery operation. The Microduino-BT is for bluetooth communication. The Microduino-LM4863 is a D-Class amplifier. A U-shape 27 pinout is used and well configured to make these boards well connected without any functional signal conflict. with Microduinos modules, you can easily design your own applications. like a network gate, a music box, a robot, smart your room and garden, a quadcopter and anything interesting. enjoy the journey of Microduino! Hi, where can I find the updated docs and files for the Battery Monitor module? The units I bought are the 20140729 release, and all the docs currently on the wiki are for the completely different older version. The URL .com is a dead link. A very nice family of cards in a small form factor. I like the separation of the Arduino board into two smaller boards so that some applications needing only the core do not carry the additional i/o. If the prices are decent I may be tempted to join in the fun! Thanks! It's really nice you like Microduino. because of separate and smaller boards, the price of the modules is lowers than other Arduino compatibles. we're working on Kickstarter and ebay, will release Microduinos soon. Can't find this on ebay anymore; shame, since it seems like pretty much the best thing ever. we're working on Kickstarter and ebay, will release Microduinos soon. please stay tune. These guy at technode.com said you would be launching at Kickstarter yesterday (Aug 22) but you didn't. I felt really pissed off because of that but I can find peace now I have found this post. I was about to mail them a dead rat. Will you launch the project anytime soon? Or, do you have any other plans? Yes, we plan to launch MIcroduino project soon, We are waiting for KS's approval right. We let you know, once we get approval.